To create new live templates we need to launch Settings and open Live Templates page. Then we can select template group or create new one. I chose second option and called my template group: “Android”. Next add new template and fill fields as below. I decided for following naming convention: first letter – “l” (from Log), second letter – “d,e,i,w” (from Log type), third letter if exists – “t” (from TAG, if it is defined). 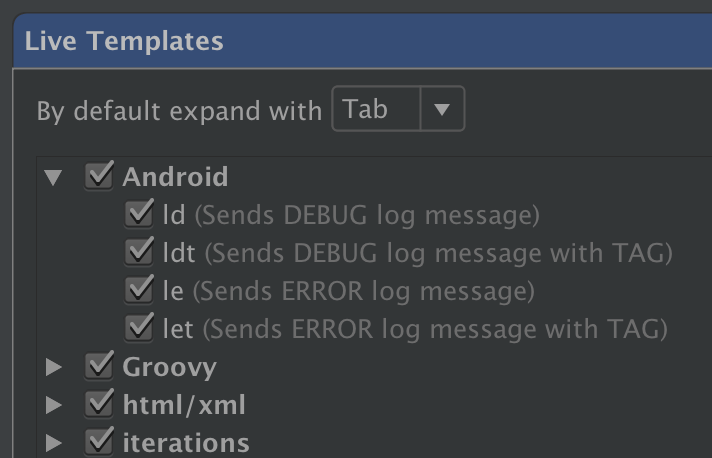 I am also attaching Android.xml file from Live Templates directory so you can faster add templates I created above. 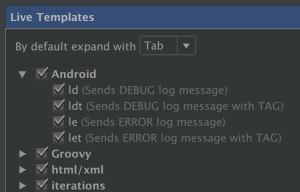 I was a bit lazy, but you can add relevant templates for other log types (e.g. info, verbose, warn). More about Live Templates you can find here. If you are using Log.d, no need to check if BuildConfig.DEBUG. When you compile your release APK, Log.d will be automatically excluded. Thanks, didn’t know about it. I’ll update it.